The William Johnston Family. 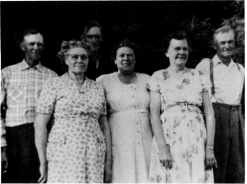 Left to Right: Ernie, Mary, Art, Clara, Alice and Frank. William Franklin was born on April IS, IS94, at the home farm S.E. 2-17-lSW, and attended Lakelet school. He worked on farms in the Clan william, Franklin and Minnedosa districts, as well as working on the dam and in the livery barn in Minnedosa. He joined the army in March of 1916, with the 107th Pioneer Battalion where he left for England that fall. Frank saw action in France, Belgium and Germany, being at Vimy Ridge and Ypres. After receiving his discharge in Winnipeg in May, 1919, he returned to Alonsa to farm on his homestead N.W. 27-21-12W which had been filed on September 21, 1915. On August 31, 1922, in Minnedosa, Frank married Bessie Marguerite Mellon, who had been born in Forest, Ontario, received-her education in Vancouver, B.C., and had moved with her parents to Mellonville, near Alonsa, in 1915. In the spring of 1935, the family moved to the Westmount district and rented the S.W. 4-17-1SW, and also the N.E. 33-16-1SW. Frank and Wendell had come in April to put in the crop and Wendell was to attend Crocus Hill school. When they returned to Alonsa at the end of May, Marguerite was shocked to learn that Wendell had been out of school for six weeks. At the end of June, the move from Alonsa, was made with horses and wagons, the cattle being herded. The first night was spent at Glenella, the next at Elk Ranch and late on the third day, the family arrived at their new home. In 1940, they purchased the half section which they had been renting and in 1946, rented the E. 21-16-1SW from Jim Turner. This land had been purchased in IS11 by Frank's grandfather, Thomas Turner, when he came from Hillsdale, Ontario, to the Clanwilliam district. resorting to the dog and skis in winter. Throughout the years, Frank was a member of the Legion, a Director of the Co-op Store and Manitoba Pool Elevators, and as well enjoyed curling and playing the violin. Marguerite was also active in the community. She was a member of the Hospital Auxiliary, the Hospital Aid, and the Crocus and Erickson W.I., as well as being a Life Member of the Legion Auxiliary and the Manitoba Women's Institute. She enjoyed exhibiting her baking in the local fairs, was a 4-H leader, and also boarded many teachers. Both Frank and Marguerite were members of the Clanwilliam United Church. In the fall of 1965, they moved to Erickson where they continued to enjoy their garden and flowers as well as spending a good deal of time with their family on the farm. A memorable occasion for Frank and Marguerite was their 50th Wedding Anniversary which was celebrated in August, 1972, with family and friends. Frank passed away in May, 1973, and Marguerite continued to live in their home until June, 1976, when she moved to Parkland Home, where she resided until her death in November, 1975. Frank and Marguerite had three sons; Wendell, Walter and Keith. Wendell Franklin, (refer to Johnston, Wendell and Mavis). 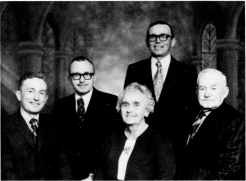 The Frank Johnston Family, Left to Right: Keith, Walter, Marguerite, Wendell and Frank.